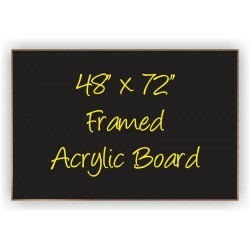 We carry both acrylic boards and acrylic matt chalkboards to meet nearly any need. Our acrylic sign boards are made of solid Plexiglas and have a glossy finish; these are available in either white or black. The acrylic matt chalkboard is also made of solid Plexiglas but has a slightly textured surface to give it a matt finish and allow it to work with traditional stick chalk. Both types of these acrylic boards are completely waterproof and will work with either liquid chalk markers or our waterproof Neomarkers.